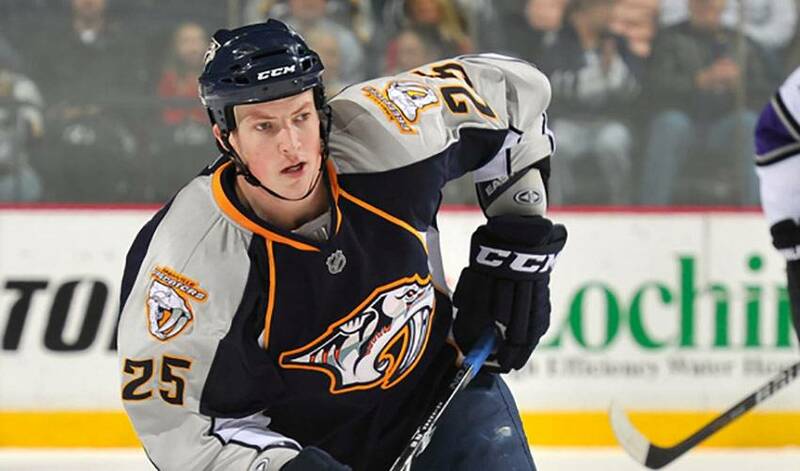 His hockey-named dog might get more attention than he does, but Jerred Smithson definitely deserves recognition for his contributions to Nashville's first-ever playoff series win. Just one day removed from ousting the Anaheim Ducks out of Stanley Cup contention, Smithson, who notched the overtime winner for the Predators in Game Five of their Western Conference quarter-final matchup, wasn't exactly mobbed by fans when he took his pooch, Reggie (named after Reggie Dunlop from the popular hockey movie ‘Slapshot') out for a walk on Tuesday afternoon. Smithson, who hails from Vernon, British Columbia, should also get a pat on the back for his efforts in the first round of the post-season. In fact, his head coach, Barry Trotz, was quick to rave about Smithson's extra-frame heroics, praising his workmanlike performance at both ends of the rink, someone who deserved to score the most important goal of the game. It was also the first overtime playoff-winning tally for Nashville. Smithson will tell you, however, that feeling pales in comparison to Nashville's series-clinching, 4-2 victory in Game Six on home ice. It is indeed happy days in Music City. The term ‘darkhorse' has been associated with the Predators for several seasons, a team that could jump up and surprise a lot of people. And while they failed to live up to that billing in seasons past, this edition of the Central Division club has shown they are a legitimate playoff club. For Smithson, it's exactly what he had hoped for. And while the road to the Cup final will only get tougher, Smithson has faith the upstart Predators are ready for the next step. Is Smithson ready to play his part and net another overtime winner? One thing Smithson, 32, won't be worrying about is getting people to notice him when he's away from the rink. No worries. Smithson has a knack for grabbing people's attention when it matters most.